A Favorite Resource: Bogglesworld | So, You Think You Can Teach ESL? I call it Boggle’s World because I imagine the little green guy (at the top of most pages) to be Boggle. And because it’s way less creepy sounding than Lanternfish. 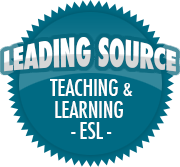 LANTERNFISH contains printable teaching resources for language arts, TESOL, TEFL and ESL. But look at their massive menu of resources (see image caption). And check out this small part of their homepage. It’s brimming with resources that are just a click away.